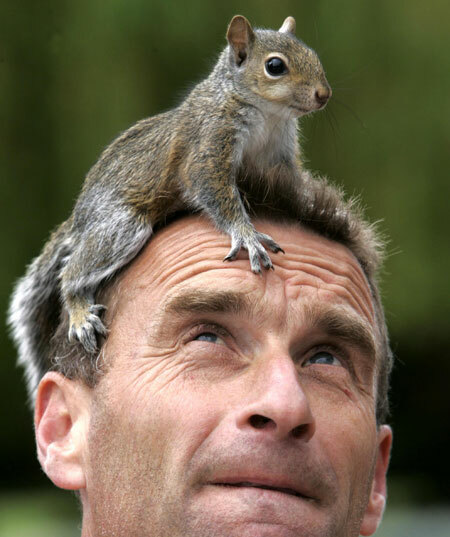 Squirrels as Models for Human Behavior? Indeed! A delightful article on squirrel behavior, biology, and sociality today highlights just how great a model squirrels can be for some true comparative research. Here’s another species with phenomenal elasticity, good learning and sociality, and even specialized brain and body parts! Behind the squirrel’s success lies a phenomenal elasticity of body, brain and behavior. Squirrels can leap a span 10 times the length of their body, roughly double what the best human long jumper can manage. They can rotate their ankles 180 degrees, and so keep a grip while climbing no matter which way they’re facing. Squirrels can learn by watching others — cross-phyletically, if need be. In the acuity of their visual system, the sensitivity and deftness with which they can manipulate objects, their sociability, chattiness and willingness to deceive, squirrels turn out to be surprisingly similar to primates. They nest communally as multigenerational, matrilineal clans, and at the end of a hard day’s forage, they greet each other with a mutual nuzzling of cheek and lip glands that looks decidedly like a kiss. The gray squirrel is diurnal and has the keen eyesight to match. “Its primary visual cortex is huge,” said Jon H. Kaas, a comparative neuroscientist at Vanderbilt University, A squirrel’s peripheral vision is as sharp as its focal eyesight, which means it can see what’s above and beside it without moving its head. This entry was posted in Animals, Evolution. Bookmark the permalink. I truly enjoyed this informative post. I am a animal health technician working primarily with domestic animals, but have interned and worked with wild animals. They are so special to me and without them, my life would have less meaning. Somethings mentioned here I was not awared of. I love feeding caring for all wild animals. expansive area he was abandoned in.